In 1891, a group of Ohio businessmen acquired the area for construction of a reservoir to supply irrigation water to the Southern California lowlands. The Arrowhead Reservoir Company was formed in that year with James Morris Gamble, of Proctor and Gamble, as President. In 1891 the company commenced construction of a dam at the east end of Little Bear Valley. In 1905 the property was transferred to a new company, Arrowhead Reservoir and Power Company. Lake Arrowhead is the result of the new company’s 185 foot high semi-hydraulic earth-filled dam constructed between 1895 and 1915. The dam was completed in 1915 and the lake continued filling until 1923. 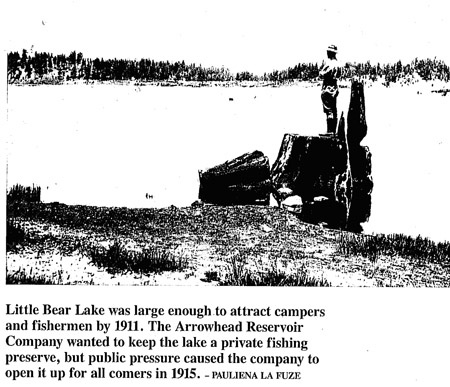 As a result of a court decision, which prevented delivery of the stored water to customers outside the natural watershed area, the Arrowhead Reservoir and Power Company ceased operations in 1921 and sold its water rights to the Arrowhead Lake Company. The Arrowhead Lake Company, a corporation formed by a group of Los Angeles businessmen, including J.V. Van Nuys, and John O’Melveny, bought Little Bear Lake and the surrounding properties, and changed the name to Lake Arrowhead and Arrowhead Woods respectively. The name was derived from a rock formation in the shape of an arrowhead on the face of the San Bernardino Mountains above Arrowhead Hot Springs. During the ownership of the Arrowhead Lake Company, approximately 20 percent of the land nearest the lake was developed, and a nine-hole golf course was built on the site of the present Lake Arrowhead Country Club. The Arrowhead Lake Company successfully applied to the Railroad Commission (forerunner to the California Public Utilities Commission) to issue bonds to purchase the domestic water system and turned those rights over to the Arrowhead Utility Company. During its first year of operation, the utility served 103 domestic customers. In 1946, the Arrowhead Lake Company was sold to the Los Angeles Turf Club, which was subsequently sold to the Lake Arrowhead Development Corporation in 1960. In 1967, the Lake Arrowhead Development Corporation merged with Boise Cascade, but continued to operate the Arrowhead Utility Company until 1971 when the utility was sold to another company, LADC. In 1971, as a result of the Sylmar Earthquake, the California Department of Water Resources, Division of Safety of Dams, ordered that all hydraulic-fill dams in the State of California be tested and evaluated for seismic stability. After an evaluation was done of the existing dam, it was determined that a second dam should be constructed to insure safety. Construction of that dam began in 1975 and was completed in 1977. That dam (Lake Papoose) was paid for by Arrowhead Woods property owners. In 1973, the LADC went bankrupt and the water rights diverted back to Boise Cascade which quitclaimed the water rights to the Arrowhead Utility Company in 1975. The Lake Arrowhead Community Services District was formed in 1978 and the Arrowhead Utility Company quitclaimed all water rights to the District. The water rights that were quitclaimed to the District in 1978 by the Arrowhead Utility Company were challenged in 2003 and ultimately settled by the State Water Resources Control Board in 2006. As a result, the District has the right to withdraw a maximum 1,566 acre feet per year from the lake. The District also has an agreement with the ALA regarding lake withdrawls. Today, the District serves approximately 8,300 water customers in the Arrowhead Woods, Deer Lodge Park, and Rimforest, and 10,500 wastewater customers. Initially in the 1920’s and 1930’s the area was mainly a resort with summer cottages. However, over the years, Lake Arrowhead has become an area of permanent, semi-permanent and seasonal character. NOTE: Lake Arrowhead itself is owned and operated by the ALA.